It seems, in my mind, that it was always cold and slushy and snowy. My brother and I would pile on our winter coats, hats, scarves, mittens, and boots and let our dad buckle us into his car. I don’t remember when this started nor can I remember when it ended. I can’t ever remember my littlest brother going with us, so by the time there were 3 of us, dad must have decided that taking us individually was a better idea. Anyway, there was a time when Chris and I always went with dad to choose our Christmas gifts for our mom. Like I said, it seems that we were always traveling through driving snow and sloshing our boots through the wet slush as we traipsed through the parking lot and sidewalks. One year in particular I can vividly remember being downtown in our small town with my dad wandering from shop to shop. We eventually ended up in a tiny store, which isn’t there anymore, that was filled with knickknacks and paddywacks galore. If you wanted a frame or a sconce or a glass lion to set on your end table? This was your store. I can still remember feeling the warmth as we walked in as the bell on the door jangled. The smell of cinnamon and potpourri filled my small nose and head. In my memory my brother has already found his gift for our mom. It was all up to me. My lack of decision-making abilities was what was between us and home. But this is where I would find mom’s gift. It was so lovely in here. I remember looking everything over, and asking my dad what he thought. It drove me crazy even at that age. I just wanted an opinion. He wasn’t trying to be difficult; he wanted me to pick for myself. In my young mind this was the perfect gift for my mom. She would be delighted as she pulled it from the box on Christmas morning and held it up for all to see by the thin, gold loop. She would place it high on the tree. I searched the tree. 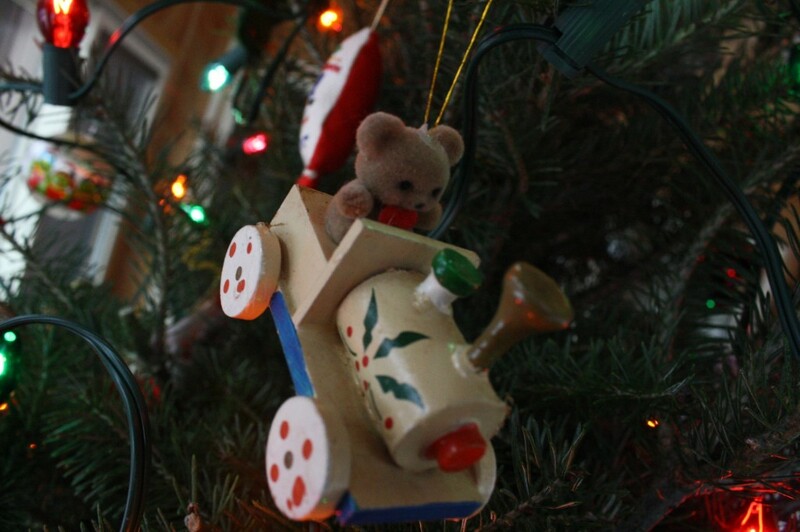 Many of the ornaments had twins and triplets scattered about, but not the little bear. He was one of a kind. I brought the small trinket up to the counter, and my dad said, “well if you think she’ll like it,” as he pulled out the crisp dollar bills from his soft wallet. After getting it home and wrapped and pushed under my bed, I worried. What if mom didn’t like it? What if dad was right? Christmas morning came. Mom opened her gifts. She ooo-ed and ahh-ed at my little choice. I was so pleased. My dad announced that I had chosen it all on my own. Mom was impressed. At some point my brother stopped coming along to shop for my mom for Christmas. But I always went with my dad. Even when I was in college, he and I would climb into his truck and head out to pick the perfect gifts for my mother. Each item that I would find he would say, “if you think that is what she will like.” I would assure him it is on the list, and that yes, she will love it. Each time we would find our way to the register and he would remove his soft wallet from his back pocket and finger the crisp dollar bills he got from the bank being sure not to give the cashier two that were stuck together. He would gather up the bags and we would head to our next stop. Last year my dad didn’t ask me to help him shop for my mom. Admittedly I would put up a stink about it each year and give him some grief for not being able to shop for his wife on his own, but I would always go. I was taken aback, and sort of sad that our father-daughter tradition had ended. Just like that. This past weekend I asked my dad if he had his shopping done yet. He laughed and said he hadn’t started. “Really? I’ll keep that in mind,” he said. What a sweet memory! Did you ever tell her that story, and ask if she was all “the eff?” when she opened it? I love that your dad finally went with out you – and that he kinda gets you love the tradition of going together. yup, i did tell her the story…i look for that darn ornament each year and have such lovely kiddish memories of when things like ornaments for a christmas present were so very important. and i was SHOCKED last year that he went without me! I can still remember waddling along with him when i was pregnant! I really loved this. We weren’t a family who held traditions and I certainly always wanted to have this sort of relationship with my dad. So, while I wipe away my tears of jealousy, know that you wrote something really beautiful. thank you so much. my dad and i don’t hug or discuss being close, but in our own way, we are. i’m his only daughter…and that is a special bond for us. I love this story! So sweet, and now that you’re a mom, you just know how she felt getting that special gift that you picked out yourself….even in it’s non-perfect shape. Your words took me to that little shop….beautiful writing! That is awesome. I hope he takes you too. I know how you like special time with your parents. thanks, babe. if he doesn’t, I understand, but if he wants me to go, I totally will. very sweet. i love your vivid memory. i miss these small moments with my daddy too!!! my parents are always amazed at how much my brothers and I remember. I am always fascinated by what I CAN’T remember. I always wonder why. And time with my dad? I will never ever take it for granted. Very sweet memories, how precious and priceless! I’m all sappy about family stories lately, this is such a good memory. so am i for some reason, hence the post. and thank you! I think so. I think my hubs is excited to take Eddie shopping when he is old enough! It’s funny how the little things like that makes us feel so loved and warm and fuzzy…kinda makes you feel like a kid again doesn’t it? Every year, we’d go for breakfast at this shoddy little restaurant that sits off of the train station. After, we always went to the “Meat Man’s” to pick up his homemade keilbasa for Christmas Eve. We do it every year. I look forward to it so much. I remember reading about that hard side of your dad on your blog. I’m glad there is a soft side too. one that can give you joy and wonderful memories. Wow, what a wonderful tradition! I bet you have so many lovely memories of shopping with your Daddy. i really do. it’s so funny each time. It always starts out as a chore to me, but I miss it now that we haven’t done it. i always remember feeling a little guilty like i should choose something less expensive. I could pick something for a dollar and the way he handles those dollars…like each one is so precious…would make me cringe. but i love that about him. I love that he counts out change from his pocket so as to not break an extra dollar. What a great story. The memory of picking out a gift for your Mom that you thought was so special and unique, is great. The part about your Dad really gets me. Isn’t it funny how we complain and joke about the little things, like having to help him shop for your Mom, but then when he tries to go out on his own and not “bother” you about it, we realize we will miss it…. I can picture every single part of what it was like to shop with him. I do miss it…even if it feels like a chore. It’s really one of the only times we spend just the two of us. What a precious memory. I hope the two of you get to go shopping this year. This is such a lovely story, and what a special tradition with your dad. I really hopes he calls you next week. me too. me too, friend. You captured perfectly the agony a child can feel over picking a present as well as the lightening bolt moment of having found the perfect gift. I both proud that your father finally went alone to pick a gift and hoping that he will call you. thank you! I can remember those feelings so vividly. I hope that helps me someday when I see Eddie making those choices. And I hope he calls me too! Oh, Katie, I’m all choked up. I’ve told you that I grew up in Maine, right? Well, in my memories of Christmas shopping, it was always slushy and we, too, shopped on Main Street, in little independently owned shops. My memories are all of shopping at dusk. I was transported back to happy memories from my childhood, Katie. Thank you for that. Guess what? our street is CALLED Main Street! 🙂 And? He asked me to tag along after reading my post. He was all happy about it. I love slushy Main Street memories. they are all warm and fuzzy. I can’t wait until Cort starts the tradition with our kids! That brought back SO many memories of me shopping with my Dad. I had forgotten all about it. Thank you! you’re very welcome! I loved doing that with my dad! I am excited that he read this post, loved it, and wants me to go again! the father figures in both my mom and dad’s lives don’t set forth and example of what OUR relationship “should” be. My mom’s dad was an abusive drunk and was never around. My dad’s dad was super old-fashioned and is a lot like you describe–not a part of his daughter’s life since they have husbands. I like that my dad and I can still be close. And he did ask if I want to go shopping! Yay!